Just recently over the weekend, Hokuto Force released the Gauntlet clone of ' Avenger +5DG ' for the C64, which originally was released way back in 1987 by Gremlin. This latest update has a brand new crack, with a new trainer and awesome graphics by Oliver Orosz, the same person behind the games Jani and graphical designs for Mystic Mansion and Guardian. In Avenger you play as a Ninja and after successfully completing your training, must avenge your step father and take back the scrolls of Ketsuin from the wicked Yaemon to appease the God kwon and release from eternal hell. If you want to play one of the better Gauntlet style clones, especially with a gorgeous new screen by Oliver Orosz and with great menu music by Ben Daglish, then Avenger should be at the top of your list. It may not be as good as Gauntlet, but being able to play as a Ninja walking around a massive 300 top down scrolling screen game, collecting keys, avoiding spiked traps, and fighting very deadly enemies with high graphical detail, certainly is a high plus point to the game. The only downside is, at least without the trainer cheats by Hokuto, is the fact is it is very very tough to beat. Enemies spawn fast, they get to you fast and once they latch on, you can't move very far at all, not unless you kill them anyway. 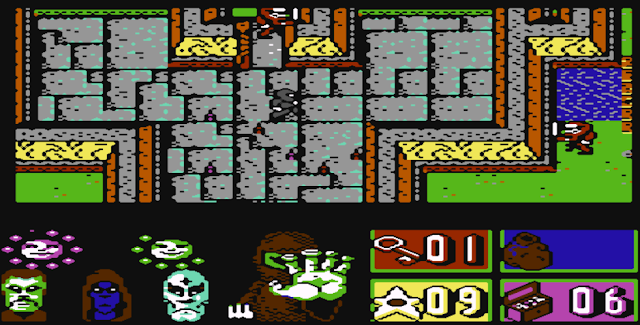 But overall it's a nice game and looks very nice indeed, so grab that C64 or WinVICE and give it a go!